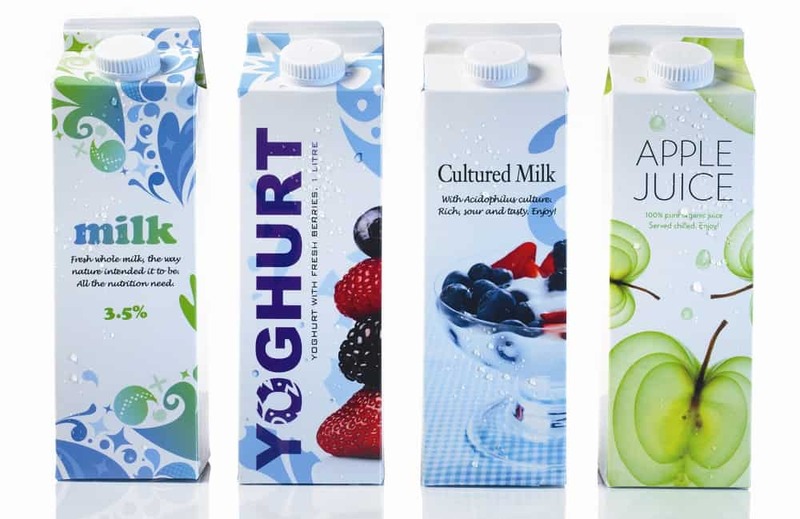 Tetra Paks are the cartons you find in the shops that are used to package milk, juice and various other liquids. You can also find products like chopped tomatoes packaged in this way. These containers allow food to be protected from contamination by bacteria and other microbes, meaning products can sit on the shelf for months without going bad. Once they’re used, Tetra Pak assure us that they can be recycled. That sounds great, but I was left wondering…how exactly are Tetra Paks recycled? Aren’t they made up of layers of different material? Is it even possible to separate them, and then what happens to the materials? After some investigating, my conclusion is that Tetra Paks aren’t a green solution at all. Here’s why. What is a Tetra Pak made from? Tetra Paks are made up of a number of components which are layered: paperboard (made from wood), polyethylene (a type of plastic) and aluminum. These different components give Tetra Paks their unique properties: keeping the liquids in but the microbes out, and a strong but lightweight container. When a Tetra Pak is recycled, all these component parts need to be separated out. Whilst recycling can be thought of as a way of converting waste into a new material, more accurately it means a process to return material to a previous stage in a process that operates as a cycle. After all, the word is “re-cycling”. The idea is to take a used product and turn them back into the same type of product, such as glass bottles being melted down and formed into new glass bottles. There is no loss of quality, so this recycling of glass can go on forever. When a product doesn’t get turned back into the same product, but one of lesser quality (as with plastic recycling) it isn’t recycled, it’s downcycled. Products that are downcycled often only undergo a limited number of cycles (maybe as few as 2) before reaching the end of their useful lives and ending up in landfill. 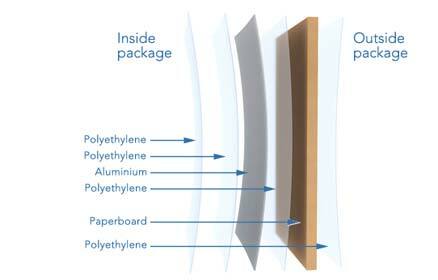 For Tetra Pak to be truly recycled, these layers of paperboard, polyethylene and aluminium would need to be separated out, and reformed to make new Tetra Pak cartons. However, that isn’t what happens. How is a Tetra Pak Recycled? I’ve found not one, but two different videos that explain how Tetra Paks are recycled: how they are sorted into their component parts and what happens to these parts. The first is a somewhat cheesy video from India, which seems to be a Tetra Pak promotional video that lasts four minutes. The second is a UK/German video that runs for less than two minutes. How much energy is involved in the process? How are the post-recycled materials used? Where is the ‘cycle’ part of the process? If Tetra Paks are recyclable, why aren’t they green? Let’s look at the different components, where they come from and what happens to them once the cartons are empty. Tetra Pak have devoted a significant amount of their website space to telling customers how sustainable their containers are. As well as talking at length about Tetra Paks being recyclable, they inform us that Tetra Pak source FSC-certified wood for 41% of their cartons worldwide (2013 figure). This equated to 32 billion FSC-labelled Tetra Paks reaching consumers in 2013. If 32 billion containers is 41%, then the amount of non-FSC wood Tetra Paks reaching consumers would be 46 million. 46 million containers made from non-renewable sources? That is a lot of wood. Tetra Pak might have a goal to reach 100% FSC-wood, but it isn’t happening now. When this paperboard is recycled, it isn’t turned back into new Tetra Paks. It is unclear whether this is because their paperboard needs to come from virgin sources to avoid contamination (as is the case with plastic), or whether the quality of the recycled paperboard isn’t high enough to make new cartons, or some other reason. Whatever the reason, it is turned into office paper. The other two layers of the Tetra Pak, polyethylene (plastic) and aluminium, cannot be separated by the recycling process and remain combined as a “polymer”. The uses for this “polymer” is in the cement industry, or as low-cost housing material. The question arises, is there a genuine demand for this product, or is there a market because of an abundant supply of this waste material? The fact that it gets reused and isn’t sent to landfill is great, except it doesn’t serve to make Tetra Paks a “green” solution. These cartons use fresh plastic and aluminium to make their cartons, and the waste products becomes something else entirely. Thus it is a linear system, not a cycle – and anything that is linear cannot be sustainable long-term. The other thing to alwyas remember about recycling, is just because something can be recycled, it doesn’t mean that it will be recycled. The two are very different. For example, in the UK access to recycling facilities is as high as 85%; in the USA it’s nearer 40%, and in other countries like China, considerably less. Tetra Pak estimate global recycling was less than 25% in 2013. In Denmark in 2007, 33% of Tetra Paks were incinerated: resources turned to toxic ash. Tetra Pak may want to be sustainable; they may want to use 100% FSC wood and achieve 100% recycling rates, but they still have a long way to go. Even if they achieve this, there’s no getting away from the fact that Tetra Pak production is a linear process. Tetra Paks are turned into different post-consumer products, meaning a constant supply of fresh virgin material (wood, oil and aluminum) is needed for their manufacture. Tetra Paks – What Are The Alternatives? Choose glass over Tetra Pak containers. Glass can be truly recycled back into new glass products. You can find wine, milk, juice and oil in glass so there’s no need to buy Tetra Paks for these items. For items like chopped tomatoes, use steel cans, which can also be truly recycled. Consider refillables, or making your own. Juicing your own fruit is far tastier than drinking pasteurized syrupy juice in cartons, and healthier too! If you can’t avoid Tetra Paks, skip the single serve containers. Buy the largest size and decant into individual containers for lunches or when you’re out and about. Did you know that Tetra Paks contained plastic and aluminium, and that they cannot be truly recycled? Did any of the statistics surprise you? Are Tetra Paks something that you regularly buy? I’d love to hear your thoughts on this so please leave a comment below! 65 Comments • Leave a comment! Excellent post Lindsay. Part of advocating waste reduction is encouraging people to recycle and at the same time to educate that a product being recyclable is not a panacea. One of the reasons I have never liked TetraPak is because invariably it is used to wrap products that aren’t necessary. E.g. passata is easy enough to make and is juice really necessary? After all, eating a piece of fruit and drinking a glass of water is much healthier! I think too many people think recycling is the solution and as long as we recycle, it’s all good. I confess I thought that for many years (it’s what I was taught in school, after all). But when you start to look into these processes you realise it’s not so clean and green after all. And you’re right – the packaging is often unnecessary. The same goes for takeaway coffee cups and other single-use items: they don’t become environmentally friendly just because they have “biodegradable” stamped on them! With Tetra Paks, there’s so much single-serve stuff which is completely unnecessary and wasteful. Plus I agree with you about juice. Made from concentrate, pasteurized fruit syrup is just a sugar explosion with far less nutritional benefits than a piece of actual fruit! If one had to choose between tetra pak and plastic, which is the lesser of two evils, assuming both are accepted at recycle centers? This a fantastic piece, thanks for sharing. I have actually been puzzling over tetra paks recently as to whether they can be recycled so thank you for clearing this up for me. I know in New Zealand a lot of recycling centres won’t accept such items as they honestly admit they can’t deal with them. I am grateful that in my town, despite being rather small, the recycling centre here is pretty good. They will quite literally accept any clean item for recycling/downcycling/reusing (except for polystyrene currently). And might I add that they provide this service free of charge, only charging you for any waste you are sending to landfill – another great incentive to encourage our townfolk to recycle. Hi Vickie, thanks for your comment. I think Tetra Pak are very keen to say it’s possible to recycle their packets, without going into the details of geography! I don’t think there are any Tetra Pak recycling facilities in Australia (definitely not on the West Coast) but because it’s theoretically possible, they can label it as such. Grrr! Your recycling centre sounds awesome! I like that you only get charged for landfill – sometimes people need a little extra incentive I think! : ) What town are you in? Hi Julie, have you thought about making your own almond milk? It’s much cheaper and far tastier! Plus much better for you.. no weird ingredients in there! You just soak 1 cup almonds overnight, drain then blend with 3-4 cups water depending on how thick you want it, then strain to remove the pulp. I use 4 cups. You can add a date if you like it sweeter. The pulp can be made into other things, dried to make flour or frozen until you need it. As for juice, is it possible to squeeze your own?! If you do get a blender at some point in the future, you can blend fruit and strain to make juice. It’s messier than using a juicer but saves you the space and cost of another appliance. “Almonds are one of the healthiest foods you can eat.” Sounds good so far! “More than 80% of the world’s almond crop is grown in California, which has been experiencing its worst drought on record.” Which means 20% is not. I exclusively purchase Australian almonds as they are local to me. (Australia is the second largest almond producer). They are also grown in Asia, Europe and the Middle East. World production is 2.9 million tonnes and the USA produces 1.8 million tonnes, so there are a million+ tonnes of almonds not grown in the USA to choose from! “It takes 1.1 gallons (5 litres) of water to grow one almond.” There are 92 almonds in a cup, which makes a litre of almond milk. That means 1 litre of almond milk requires 460 litres of water to produce. “this isn’t to say cow’s milk, which takes about 100 litres of water to produce 100ml of milk, is more environmentally friendly”. A litre of cow’s milk requires 1020 litres of water to produce, so it is still more water intensive. (The original source quotes 250ml as requiring 255 litres). More than double! Not to mention the erosion, methane produced, disposal etc – whereas trees release oxygen into the atmosphere. “Its production is not concentrated in one area of the globe.” In 2014 California produced 2.14 billion pounds of almonds. In the same year California produced 42.3 billion pounds of milk. So regardless of worldwide production distribution, California produces more milk than almonds, and milk has a greater environmental impact than almonds. Great post, thanks! My son brought a Tetra Pak home recently, and I started reading into their composition and possible recycling…it’s amazing how many people still believe cartons like this are just cardboard! Thank you! Haha, yes, I think people want to believe they are just cardboard, because they want to think they are being environmentally-friendly! Or because these companies do a pretty good job of convincing the public they are “green”! I did not know this. I like Almond milk but that is the only way they package it here in the US. You can not buy it in bottles or even #2 plastic. :( There needs to be a better way. Yes I do have a blender. :) I will check out your post. I think I remember seeing it awhile back but forgot about it. You can do so much with a blender! Helps with the decluttering of the pantry too and you need less ingredients. Wonderful post! When I first started researching the “green products” I was buying I was taken aback at the green washing Tetra Pak was pulling. I’ve never liked store bought almond milk, I make my own, so no problems there, but I can’t seem to find silken tofu out of the nasty containers. Another company I am very suspicious of, and not a fan of their message in the US, is Boxed Water is Better. There seems to be a disconnect or lack of data on their packaging materials and the ship empty idea. I also don’t like that it makes less aware folks trying to do the right thing believe boxed water is better. Buy a dang steel bottle, that’s way better!! Anyway, thanks for the great post. I can’t wait to peruse your others! Thank you! : ) You’re right, they are so so keen to push how green they are that it automatically made me suspicious! But finding out what actually goes on when Tetra Paks are recycled wasn’t so simple… and transparency is very important I think! I haven’t heard of Boxed Water but I looked it up. Woah!!! Blown away – but not in the way they probably hope! How exactly is boxed (plastic + paper + aluminium) better than plastic or glass alone?! Like you say, get a steel bottle and drink from the tap! Fit a home filter if you have to! But don’t buy into that! Grrrrr! Thanks for sharing. Well, kind of thanks, except now I’m feeling really mad and indignant at their greenwashing attempt! It makes me nuts too. If it weren’t for putting in their hashtag on Instagram and seeing all manner of young people taking artsy photos of their crap boxes I may have been able to avoid opening up a beer and drafting a post about them! I feel like I have to put it out there, no matter how few people see my message. Hopefully more people will see great blogs like yours and be moved in the opposite direction! Wow I learn something new every time I visit here. I rarely buy the tetra packs because they aren’t recycled here. Occasionally I will pick up an almond milk for a recipe but that’s about it. I had no idea there was aluminum in the layers and the idea of ridding my home of plastic then bringing these home regularly doesn’t make much sense. I don’t use them because of the plastic liner and that any composite products like this one are really hard to recycle. Thanks for raisinging the issue and writing about it so well! I just wish more people knew what they were made of and how they are processed (rather than recycled) once they enter the waste stream – so many people think they are made of paper only and will biodegrade! Steel cans are usually lined with plastic these days – it is hard in the UK to get milk delivered in glass bottles, mostly it is in plastic containers which are recycled locally. For us, it is fruit juice that is bought in the largest possible Tetrapak. We cannot grow citrus outside (we make some of our own apple juice but cannot grow & juice a year’s supply as well as have apples to eat) and they are expensive to buy in bulk to juice. If we have a glut of tomatoes we can make our own passata etc and I would not buy this in Tetrapaks but I guess you have to look at what you can/cannot do in your own situation. I totally agree with you, it’s all about making the best of your own situation. We’ve changed a lot of our habits since giving up plastic – not deliberately / intentionally, but it just happened over time. I feel much healthier for it! Under the heading “Plastic & Aluminium” in your original Blog, I noticed that you say that the plastic and aluminium cannot be separated by recycling processes. This is not entirely correct. – Although you are almost right, as the extent of separation operations for Aseptic cartons is very limited. Whilst it is difficult to do, it is usually achieved by using “Hydropulper” machinery. It works rather like a large washing machine. Water is added, and the empty cartons are pulped in the machine. Eventually, the three components become separated: wood fibre; plastic and aluninium. From what I have been able to find out, there is currently none of this happening in Australia at present. Although, I believe there was a Hydropulper plant operating in the Shoalhaven area some years ago. Consequently, even though the Aseptic cartons bear a “recyclable” logo, almost 100% of them currently finish up in landfill. – This is despite the fact that most consumers unknowingly place such empty cartons in their yellow-lidded recycling bins. – In fact they have to be sorted out, and sent to landfill. If any of your readers have information concerning actual recycling of Aseptic cartons, I would love to hear from them. Hi John, thanks for your informative comment. I probably should have written “cannot be separated by current recycling processes” – technology is always moving. What highlights how non-environmentally friendly tetra-paks are is the need for such high level technology for separating these materials. People make assumptions that they are easy to recycle and this thinking appears to be encouraged by Tetra Pak, when in fact it isn’t the case at all. Thank you for your article. I largely agree with your comments and analysis on the disposal phase of tetra-paks, but I would like to remind everyone that disposal is just one phase of the cradle-to-grave life cycle of a product. Frequently the largest share of the environmental impact of a product does NOT occur in this phase, but during raw-material production, manufacture, distribution, and use (e.g. in the case of a coffee maker or hot water heater). With this in mind, it is not at all clear to me that tetra-pak containers are less green than, say, glass containers. First, glass is quite heavy in comparison and thus requires far more fuel to transport. Second, tetra-pak food frequently does not require refrigeration, another huge source of environmental impact. Third, the geometry of the tetra-pak lends itself to efficient packing as therefore saves transport fuel. Tetra-pak has actually done several life cycle assessments on their product (see http://www.tetrapak.com/us/sustainability/managing-our-impact/climate-impact/life-cycle-assessments). I have not done the necessary research to come to a final judgement on the greenness of tetra-pak, but I believe that the issue is far more complex than you have presented here. Hi Wormcast, thank you for your comment. I agree with you that environmental impact is greatest at the stages you mention – and a product like Tetra Pak, which is not recyclable, and encourages new raw material use, is therefore more environmentally irresponsible than one that can be truly recycled. In regards to your comment about Tetra Pak not needing refrigeration, I am not sure where you live but in both the UK and Australia Tetra Paks are commonly used from low-pasturised fruit juice, smoothies, milk and other dairy products which do require refrigeration. Tetra Paks do not mean a product does not need refrigeration – this depends on the type of product and the heat treatment, the same as for glass or other materials. I wrote this article because I feel that Tetra Pak spend a lot of time and money telling customers that their products are green and easily recyclable and this is simply not true on a practical level. My feeling is that this is irresponsible. Of course buying products in any packaging uses more resources than buying with no packaging at all, and if you read my blog you would know that I don’t buy products in packaging; glass, Tetra Pak or otherwise. However, I would never buy products in a Tetra Pak with plastic that will end up in landfill. Glass bottles can be returned and refilled, Tetra Paks cannot. You are right, the issue is far more complex than I’ve written about here. This is a blog post, not a scientific paper, and I limit the length of my posts. I would need several posts to deal with all the issues! 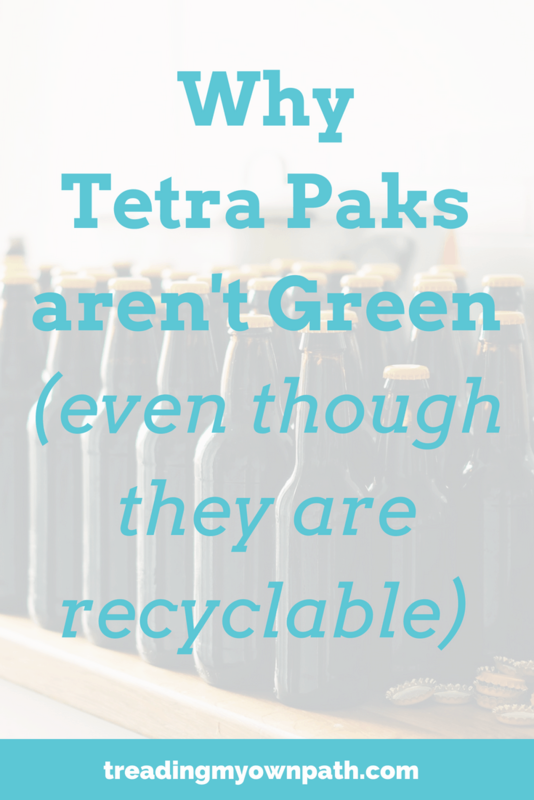 The title of this post is that “Tetra Paks are not green” and focuses on the recycling claims. Of course no single use disposable product is green, and shipping any product across the state, country or ocean to be used once somewhere far away is not green either, regardless of the packaging material used to transport the material. Most companies don’t go to great lengths to try to persuade their customers that their particular product is environmentally responsible, which led me to look further into some of the claims that Tetra Pak have made, and draw my own conclusions. Hello and thanks for the article and discussion. It produces brand new aluminium with low temperature process in a plant in Spain). Thank you Lindsey for an interesting perspective on this. What’s your take on this new Gable Top which TP has recently introduced? Is this a full step in the right direction? I like the move away from fossil fuel plastic, but bioplastics are still not commonly recycled or composted. Even where they are, it is still a huge waste of resources to manufacture anything for single-use. I would like to see the system change – more reusable systems in place, for example people being able to refill bottles themselves via dispensers, or use returnable bottle schemes. If we are going to solve the waste problem we need to move away from this single-use epidemic. These new Tetra Paks do nothing to enable that. Great Article! Have you seen a new product, water packaged in tetra pack mentioning something against plastic on their packaging? Of course plastic bottled water is not good either. But people are getting confused by such false marketing and they think tetra packs are green. We really need to spread the word and point out what exactly is sustainable and what is not. Loved your blog! Have you thought about making your own? I’ve never made rice milk, but most plant-based milks are very easy to make. I make my own nut milk – no additives, thickeners and fillers, and no waste either. Tetra paks are pretty hard to recycle. Personally, I’d probably buy the biggest 6litre plastic containers, and recycle them. I think that would be less energy overall. Or if you have any way to buy milk in glass, of course – but that isn’t an option everywhere. Hey Lindsay, I really like that you think about products we use on a daily basis and what happens with these products after consumption. The article has some absolutely correct information in it, for example that carton packaging may contain an aluminum barrier. However, that is not always the case. Cartons for fresh products (fresh milk or fresh juice) do not have this aluminum barrier as it is not necessary for products with a short shelf life. For long life products, as you have correctly stated, some kind of barrier is necessary so that the product inside is properly protected from light and oxygen. So it is not always the case that the cartons contain aluminum. Also, you got some things mixed up there: the FSC certification is not an indication for a product being recyclable, but it shows that the carton layer comes from responsibly managed forests. However, that also does not mean that non-certified cartons come from illegal forestry. FSC has nothing to do with renewable materials – that is a whole chapter for itself. Also recycling does not mean that an object is turned into the same object again. A carton is definitely recyclable as it is for example recycled into pizza cartons. Also the fibers can actually be recycled six times (and a glass bottle cannot be recycled infinitely – that would be awesome – but about 60 times, which is of course a very high number. Another very important aspect when thinking about environmental aspects of packaging is not only the material it consists of, but the whole life cycle needs to be assessed. There are reports for all sorts of materials on life cycle assessments (for disposable glass and PET bottles, for deposit glass and PET bottles, for cartons etc.). If you take a look at these you will find that cartons actually have a lot of benefits and advantages in comparison to glass because it is much lighter for example. This means that regarding transport, there are less emissions for cartons compared to glass bottles. Also the production of cartons is much more environmental friendly than the production of glass as 85% of natural resources are used for a carton. Some cartons even include renewable PE made from sugar cane or by-products from food production which means that about 96% of the material used is renewable. As you can see, there is much more that needs to be taken into account than just the materials used. It is not just black and white and cartons are much more environmental than you might think. So before you go and tell people to buy glass bottles, please read a little more about the production and recycling of these. We do not take milk In tea or coffee and don’t make many milky puddings therefore it is no good my buying fresh milk. I have to buy long life milk which is in cartons. However I don’t buy it often and hope that I am not adding too much to the destruction of the planet. Do you think that tetra is a better way to purchase tofu than the other main alternative (plastic shells)? I’ve made my own tofu before, but it is a massive project. Loved your article! As a vegan I was shocked when I realised that all the oat milk I was buying thinking to contribute to an greener world was so far from helping the planet. I have started then to make my own oat milk – just water, organic oat and agave syrup and it’s absolutely delicious and kept in glass bottles. Green & Cheap! How can a tetra pak be recycled (in theory) but a take-away coffee cup cannot? Isn’t the same sandwich layering of plastics and paper used for both products? I’m an Aussie living in the birthplace of Tetra Pak – Sweden! It is virtually impossible to buy milk in anything other than this product and it’s really annoying that the largest size you can buy is only 1.5 litres! As for recycling, kerbside collection takes household rubbish (that is burnt) and compost (that is fermented into Biogas) – everything else you have to sort and store at home until you take it to neighbourhood collection bins – a pain in the proverbial! Weird thing is that envelopes have to be disposed of in household rubbish as apparently there is an issue with the glue! Why not change the glue? There seems to be no issue with the glue used in cereal boxes! If one had to choose between tetra pak and plastic, which is the lesser of the two evils, assuming both are accepted at the recycle center? “Hydropulper” machinery. It works rather like a large washing machine. Water is added, and the empty cartons are pulped in the machine. Eventually, the three components become separated: wood fibre; plastic and aluninium. From as I understand technology is now catching up for a product to be down-cycled in to a product that will not end up in the body of animals and our ocean creatures. Recycled snobbery stunts solutions. As I understand Tetra Pak have actually provided solutions to the recyclement of its products. You provide a solution as grow or make your own but not provide a solution to your critique of Tetra Pak, who have educated and provided solutions to the re-cyclement of its unique product. A moe well known blogger on green issues offers a solution critique to your Tetra Pak rant. Solutions please. Assist a global concern, Tetra Pak are not Coca Cola. I guess I’m back to the refrigerated cardboard container products. There’s a huge part of this conversation that’s not happening here. TetraPak have two strong sustainability claims which stand apart from the recycling issue. One is the weight of the packages. Shipping a TetraPak takes far less fuel than shipping glass bottles. in the case of something like wine, that’s a big deal . Also putting milk and other perishables in TetraPak means they don’t need to be refrigerated – that’s another huge energy savings. Finally, they extend the shelf life of all kinds of things potentially reducing food waste. So it’s a little more complicated than whether the packages wind up in a landfill. Hi Axon, thanks for your comment. My website is about waste minimisation which is why I have focussed on the recycling (or not) issue only. All the points you make are fair, but if we are talking about bigger issues, then I think we can discuss the idea of a centralised food system where food is made to travel such long distances that it “needs” to be packaged in this way. For example, as the second biggest almond grower in the world, it is possible to buy local almonds in Australia, and local almond milk. Yet the shelves are lined with Tetra Paks of brands manufactured overseas, particularly the USA. So yes, a Tetra Pak would weigh less than a glass bottle of the same product, but then my question is why do we even need to ship these products such long distances for our everyday consumption? Particularly when we consider that some brands are only 2% almonds and mostly water. We are shipping water across the globe – in Tetra Paks. It is indeed a lot more complicated than landfill. I appreciate the all the focus on saving the earth… I do my own recycling with minimal waste of everything I do. I even leave my cell phone at home to protect from that radiation when i leave for the day. We buy soya milk in Tetra Paks, and so far, can’t find an alternative. Would love to see change in this market. Hi Jess! I’ve seen soya milk in paperboard cartons (paper and plastic but no metal liner) which some paper recyclers will accept. I’ve also seen the So Good brand in plastic number 1 (PET) bottles which is the most recycable and recycled type of plastic. They might be better options for you? Good luck! The tetra pak and plastic container thing seems to be mostly about the seal built into the cap, which has become a culturally accepted thing. So we just put all of the juices and milks in the same 330ml ring pull tins, or whatever, that the standard can of fizz comes in: I appreciate that folk will always require larger volumes, but any of a series of smaller containers will likely be consumed before any unused content gets a chance to degrade in a fridge. So, you buy and use more steel or aluminium containers? But ALL of them can be easily recycled; and with smaller containers any waste will be of a limited quantity anyway. Plastic (including Tetra) threaded caps are the problem. The whole of the plastic problem revolves around the sealed cap. Just put small ring pull tins out there and see what the take up is! Hi Dain, I don’t entirely understand your comment, but I wanted to add for clarification, the issue with Tetra Paks is not the ring pull but the container in its entirety. They are difficult to recycle in many places and not recycable or recycled at all in Australia. Lindsey, thank you for an informative article. It is well done. But have you heard of an Ecuadorian company that is using the aluminum component of tetrapak to manufacture a 100% recycled building and material products? http://www.ecuaplastic.co. Cool stuff. If this interests you, please contact me. Dan.